Close to the Gate House is the Little Onofrio’s Fountain. After the aqueduct was completed, its builder Onofrio della Cava set two public fountains at the western and eastern ends of the Placa. The small fountain was placed at the eastern end to supply water to the market place which was in Luza Square. Built in 1438, it is a combination of function and decoration. The sculptures were made by Pietro di Martino of Milan. 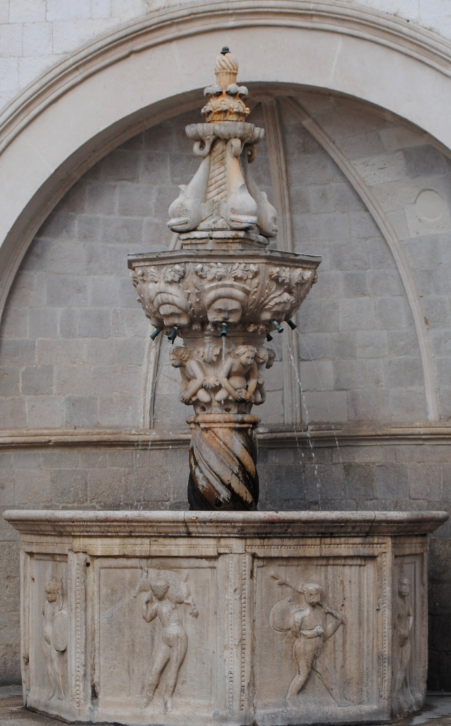 This fountain was used only by Christians during the Middle Ages as water had a religious significance.